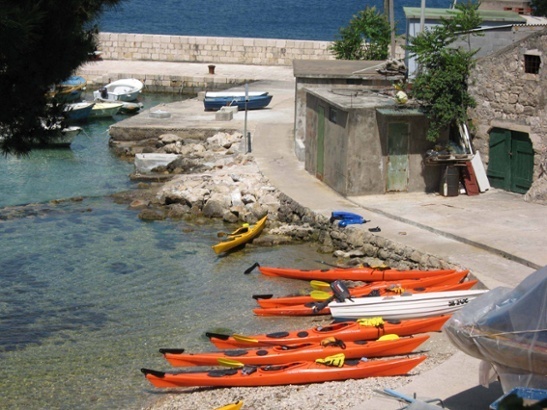 Touring by kayak gives you an intimate view of Dalmatia. The islands are small and close together, so paddling by kayak is an ideal way see a great deal in a single day. Three Islands, One Day begins with a ferry ride to Lopud Island from the ferry terminal in Dubrovnik's Gruz Harbor. Three Islands, 1 Day begins with a relaxing 50-minute ferry ride from Dubrovnik, where you’ll take in Dalmatia’s dramatic coastline from the sea en route to Lopud Island, the middle of the three inhabited Elafiti Islands. Three Islands brings together the best of three distinct islands, as well as a hidden underwater cave, swimming, snorkeling, and cliff jumping. Begin paddling on Lopud, known for its sandy beaches and Lopud town’s lively waterfront promenade. Destination two: Šipan Island, the furthest of the three inhabited Elafiti Isands. A one hour paddle brings us to a small bay with an unpretentious fishing village, where we abandon kayaks to visit Šipan’s second small village, Luka Šipanska, the furthest out of the five villages in the Elafiti archipelago and least visited by tourists. Luka, nestled in a deep bay, offers lovely views of the outer, uninhabited Elafiti Islands and Pelješac Peninsula beyond. Šipan, known for its rich history, is home to thirty-some stone churches and claims more olive trees per square meter than any part of Greece. Destination three: little Ruda for a quick swim before the short paddle back to Lopud and a ferry ride home. In early spring and late fall, when water temperatures are chilly for comfortable swimming, we fill our time on the islands hiking Lopud and Šipan’s network of trails with dramatic views of the islands and mainland coastline. Lunch, at a seaside restaurant overlooking a small bay, is not included in the tour price. Bring a bottle of drinking water, sun protection (hat, sunglasses, sunscreen), towel, a dry layer for the ferry ride home, and money for lunch. We eat at a fantastic seaside restaurant on Šipan Island. A camera is optional. Wear a bathing suit with clothes over. AKT supplies all of your kayak and snorkeling gear, including aqua shoes for kayaking, swimming, and walking on the rocky shoreline. We supply dry bags for your personal items (wallet, camera, clothes, towel, and phone), which stay dry in your dry bag stored in your kayak bulkhead compartments while you are kayaking. These items are available while you are on the islands. On the islands you have time to hike, swim, snorkel, explore small villages, cliff-jump, relax, and eat lunch.